As the waterfowl program leader for the Louisiana Department of Wildlife and Fisheries, part of Larry Reynold's job is to give duck hunters the best opportunities he can. That takes money, of course. Lots of it. But like most state wildlife agencies, his is operating on a shoe-string budget. So Reynolds was thrilled when regional representatives of Ducks Unlimited announced a grant package that would allow the construction of an impoundment adjoining to the Dewey Wills Wildlife Management Area. The total cost was $1.9 million. "We could have never done something like that by ourselves. We just don't have that kind of money," says Reynolds. "We meet with DU representatives about every two or three years and go over a list of things we'd like to accomplish. They go out and look for money to make those projects possible and often implement and oversee the entire project." Not only did DU find grant money through the North American Wetlands Conservation Act, they assembled a group of partners, designed and engineered the project and oversaw construction. Once the project was completed, DU turned the property over to LDWF. Hunters now have a 3,600-acre green timber hunting opportunity that didn't exist three years ago. The conservation organization also provided technical help for improving Wham Brake Reservoir, helped restore 7,000 acres of Oyster Bayou, added huntable wetlands to Sherburne WMA and improved 300 acres on Tensas NWR, among other projects. It's not just Louisiana hunters reaping the benefits. Every state has been touched by DU and every duck hunter has benefitted, in one form or another, even if those benefits are intangible. You want to build it, and they will come. DU's team of more than 30 biologists partner with universities, federal agencies and conservation groups to fund and carry out studies that help us better understand waterfowl, their habitat and the best ways to boost their numbers. "Two projects we are working on right now are sponsored by DU. Students are doing the on-the-ground research and their biologists are serving as advisors," says Louisiana State University wildlife professor Luke Laborde, who also serves as DU's state membership chairman and advisor for LSU's student chapter. One study is examining the genetics of mottled ducks along the Louisiana and Texas coast in an effort to determine if they are two distinct populations. Satellite transmitters are attached to some ducks to get a better handle on their range and habitat use. Another joint study is examining lesser scaup diets on Lake Pontchartrain. "We know they are experiencing lower productivity on their breeding grounds," says Laborde. "Is it because their food sources have changed on their wintering areas? Are they in poorer shape heading back north because of those changes? We hope to figure out what's contributing to their decline." DU's scientists don't just study ducks. They help landowners navigate the enrollment process for programs like wetlands reserve and CRP. "We also provide technical assistance so farmers can better implement conservation practices while still making a living," says Johann Walker, DU's director of conservation programs for the Dakotas and Montana. Founded in 1937, Ducks Unlimited was born in the midst of an epic drought combined with the rapid draining of seasonal wetlands throughout the Dakotas, western Minnesota and parts of Canada. Alarmed by the decline of ducks and the loss of critical wetlands, four hunters, John Huntington, Arthur Bartley, Ray Benson and Joseph Knapp, knew they were facing a monumental challenge. Many Americans were more worried about a paycheck than a duck. They were relentless in their efforts, and DU is now one of the most powerful and influential conservation organizations in the country. To date, DU has played a role in conserving 13.6 million acres. Much of that work takes place on private land, a contentious topic with some duck hunters. Reynolds, however, says more than two-thirds of the hunters in his state rely on private land. "The vast majority of the land in Louisiana is private and ducks use that land, so it makes sense to improve the habitat wherever it is needed," says Reynolds. "I can tell you DU spends far more on projects on public land in Louisiana than private." That's not true in the Prairie Pothole Region. But that's because the vast majority of the critical nesting habitat in the Dakotas is on private property. Just 3.9 percent of North Dakota is federal land; only 206,000 acres are managed by the USFWS in South Dakota. "We grow our ducks in the Prairie Pothole Region and 90 percent of it is private," says Walker. "Most of the land that is owned by the federal government is already protected. It's not at risk of being drained or converted from grass to crops like private property is." DU can't force a landowner into preserving the habitat on his land anymore than they can coax him into allowing people to hunt. They can offer money to help preserve habitat, though. Last year alone, the organization spent $5 million on permanent conservation easements in the Dakotas and Montana. The money helps farmers offset any future loss of income from the conserved land. More than 40,000 acres of habitat were protected in North Dakota alone in 2015. It's expensive, admits Walker, but there's no better incentive than money and there's no more important time to act than now. Three-quarters of the native prairie is gone and half the region's wetlands have been drained. That loss is obvious to anyone who has driven across the prairie. Backhoes and stacks of drain tile remain a common sight in the duck factory. What isn't quite so visible is what goes on in the halls of Congress and state legislatures. Thirteen people work specifically on policy issues affecting waterfowl and hunters. They educate legislators and twist arms on behalf of waterfowl. Recent victories include the increase in the price of a duck stamp, which will add an additional $100 million over the next 10 years to conservation efforts, reauthorization of the Land and Water Conservation Fund, which is directly responsible for the purchase of public access, and increased hunting on NWRs. It's true the words "hunting" or "hunter" do not appear in DU's mission statement, which simply says, "habitat conservation." 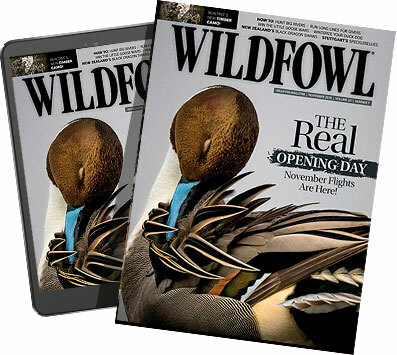 Flip through the magazine, attend a DU banquet or an outdoors event, though, and you'll see nothing but hunters and hunting-related articles, gear and other hunting-specific activities. "I hear people say we wouldn't have duck hunting without DU, but I can't say I agree with that," says Reynolds. "What I can say is that we would absolutely be worse off. They are an extremely important part of wetlands conservation. That not only benefits ducks, it benefits duck hunters."